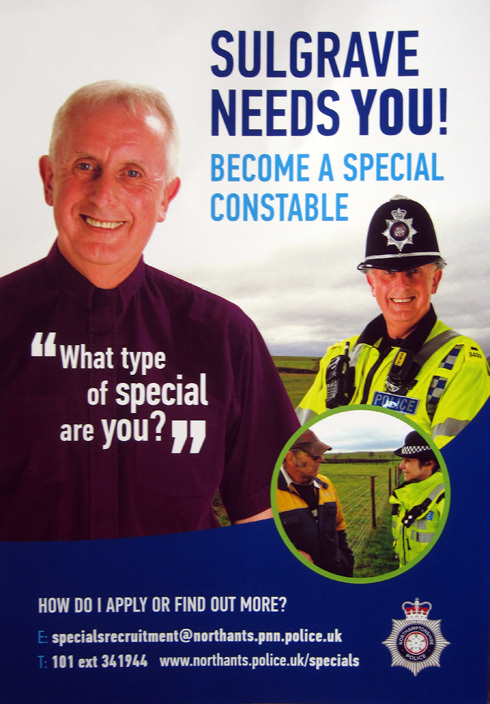 Northants Police seeking volunteers for “Parish Special Constable”. Adam Simmonds, Police and Crime Commissioner for Northamptonshire, aims to appoint a Parish Special Constable for each village in the County. He says: “This is an exciting new role giving individuals the chance to be involved in making a real difference within their own community. Parish Specials work with regular Police Officers and Parish Councils to make sure that the issues that are important to the local community are resolved. They patrol the area in uniform speaking to people, providing reassurance and discouraging crime. Parish Special Constables are able to provide a genuine and sustainable solution to almost every issue that makes residents feel unsafe. The role aims to tackle crime and antisocial behaviour that doesn’t make the headlines but can make lives miserable“. This entry was posted on Thursday, August 13th, 2015 at 4:10 pm	and is filed under News. You can follow any responses to this entry through the RSS 2.0 feed. You can leave a response, or trackback from your own site.